The restaurant has now kicked off the concept of Pop-Up Kitchen Series, where a specialty chef is invited to display his culinary art. 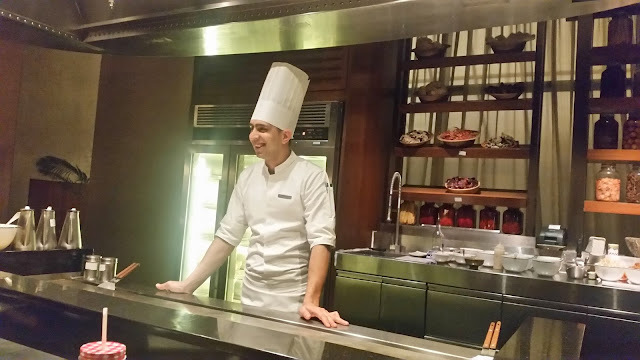 Teppanyaki is the first initiative in this series featuring Chef Amit Sharma, the Teppanyaki chef of TK’s Oriental Grill of Hotel Hyatt Regency, New Delhi. 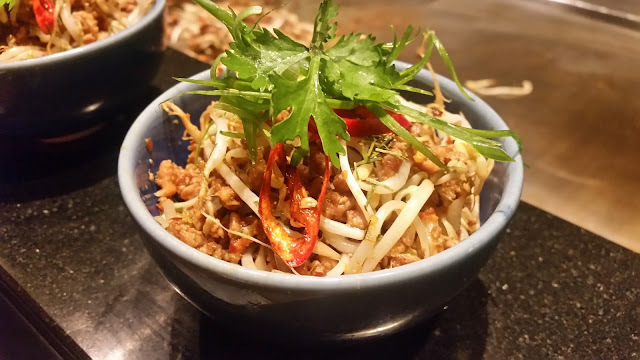 The Teppanyaki pop-up, which has started on 19th February, will be on till 28th. Special menus for vegetarians and non-vegetarians curated by Chef Amit are being offered during this period. Invited for a preview of the pop-up, I was extremely happy to experience the interesting concept where the guest is able to sit across and watch the preparation of each course while interacting with the chef. 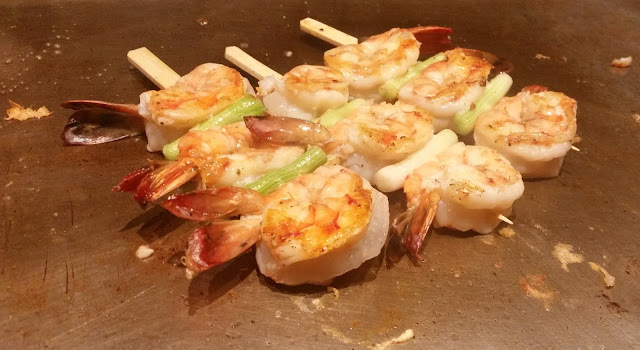 In Japanese Teppanyaki style cooking, a hot metal griddle is used to prepare the food. All the items from starters to the main courses are prepared on the heated surface, mostly using the stir fry technique. Chef Amit who originally hails from Chattisgarh was deft in using his spatulas, and it was fascinating to watch him prepare each item with ease. The set menu has soup, salad, appetizer, main courses and dessert, where only the soup was brought in from the kitchen whereas the rest were prepared on the griddle. Since all of us were non-vegetarians, we experienced the standard non-vegetarian set menu. The chef started with the preparation of Spicy Minced Chicken Salad. Here, coarse chicken keema was stir fried with the addition of select spices and then sprouts were added to the mix. 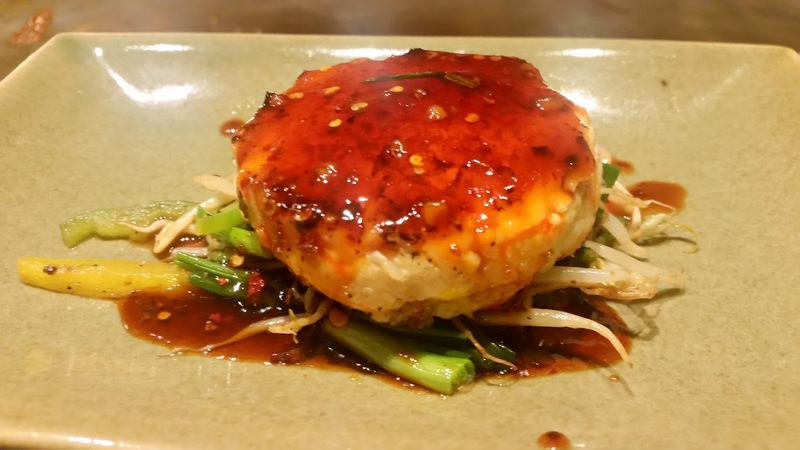 Garnished with mizuna and red chilli slices, the dish was exotic. Next in was the Miso Shiru Shrimp Soup. Miso paste and a Japanese seaweed were the main ingredients here, giving a muddy look and feel to the soup, slightly overwhelming the shrimp flavour. 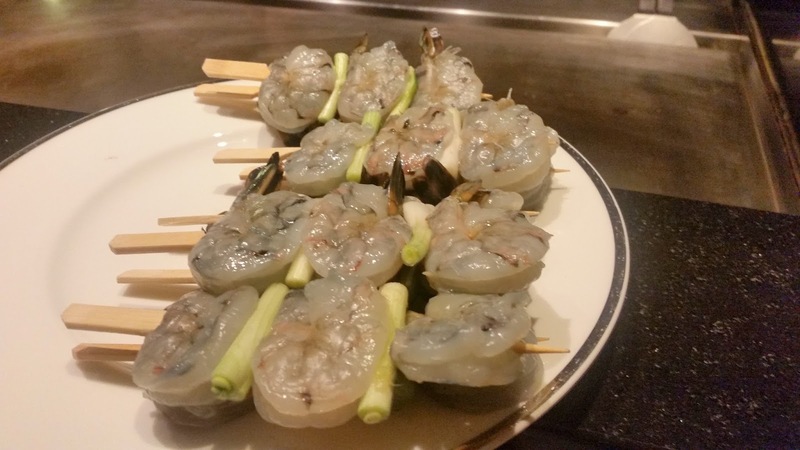 Yakitori is traditional Japanese skewered food, and on the menu, we had Prawn and Spring Onions Yakitori. It was interesting to watch the chef prepare this one, right from stir frying the raw prawns and spring onions on the stick to further sautéing after addition of sauce and seasonings. 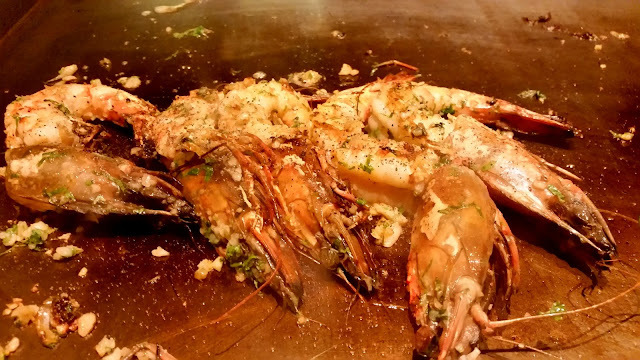 The result was soft and succulent prawns doused in a delicious sauce. We had three main courses. 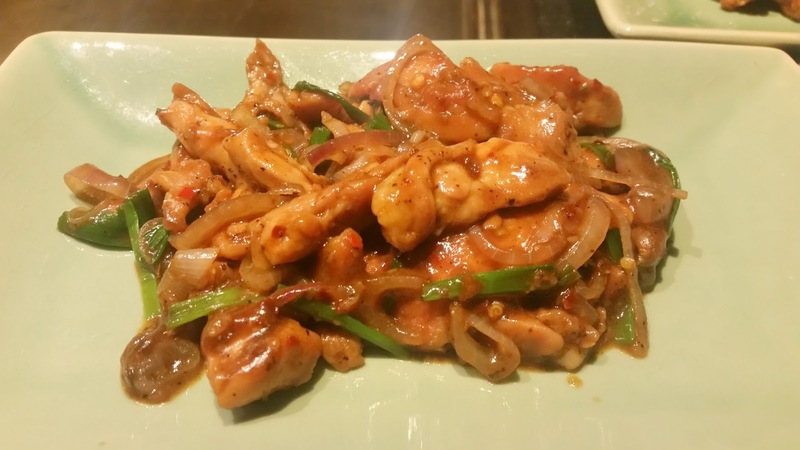 The Shredded Chicken in Black Bean Sauce was exceptional with a hint of sweetness. It tasted good on its own as well as with the Chef’s Special Sticky Fried Rice. But in my opinion, the dish of the day was the Sauteed Tiger Prawns in Oriental Yellow Curry. The jumbo prawns were delectable and the yellow curry was one of the best I had with the white rice served along with it. After this the chef was gracious enough to serve us a main course from the vegetarian menu – Goma Tofu steak served with veggies and soya sauce. The steak had potatoes and tofu in it, and the taste of the combo reminded us of a famous North Indian street food. 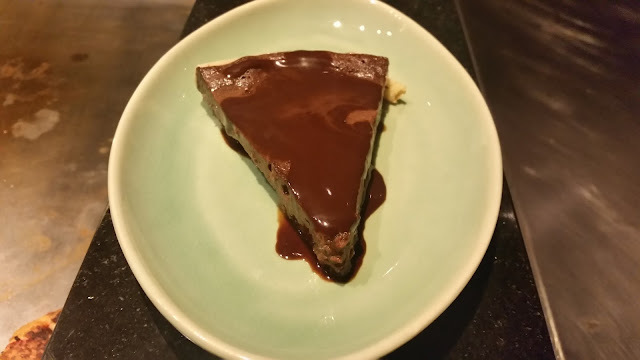 The last act on the teppan was the flambing of the Chocolate Tart, which was served with vanilla ice cream. I found the idea of pop up extremely timely for Hyderabad. The food lovers in Hyderabad are becoming more and more discerning and they want to try out new cuisines and flavours. Teppanyaki is something they are going to enjoy. The pricing for the set menu at Rs 1400 plus taxes per person is also quite reasonable. The restaurant has time slots for Teppanyaki, so please call them before visiting. What is the price of the set menu?